CBD oil, which comes from the marijuana plant (but doesn’t contain psychoactive properties and can’t get you “high”) has become the new "superfood" of the workplace, offering many health benefits. In 2018, the Farm Bill was signed, making CBD oil legal in all 50 states. So, where does that leave you, the employer? 1. How to regulate the use of CBD oil in the workplace? 2. How to manage drug testing programs? This white paper will address both the benefits and risks of allowing CBD oil in your workplace, including three ways you can start navigating through this controversial issue. 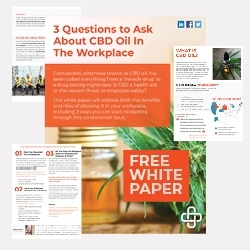 You may download a free copy of “3 Questions to Ask About CBD Oil in the Workplace” through the following URL: https://info.axiomllc.com/3-Questions-To-Ask-About-CBD-Oil-In-The-Workplace.